It’s Cinco De Mayo week, which I think after Thanksgiving might just be the best food holiday in the world. Margaritas, chips and salsa, cheesy quesadillas and enchiladas and ALL THE GUACAMOLE!! What’s not to love? Though certain Mexican dishes can be a bit indulgent (especially after you down three baskets of chips, like I normally do…oops! 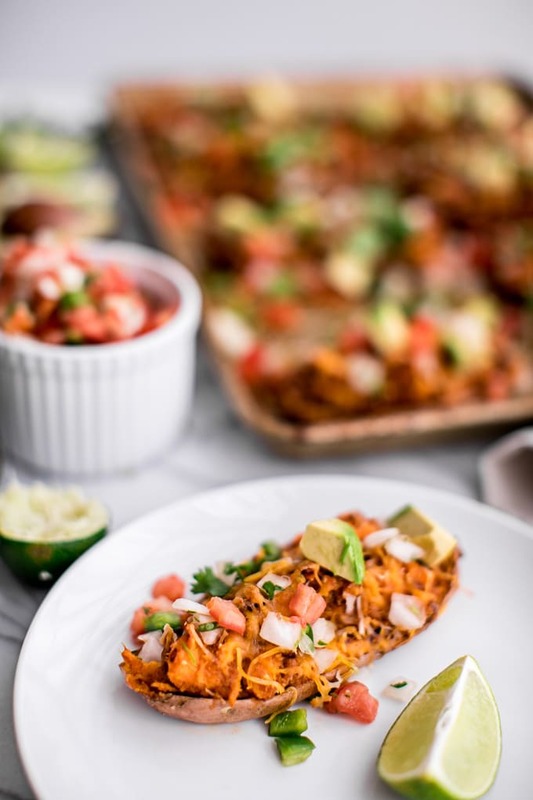 ), I’ve actually found that eating Mexican-inspired meals is one of the easiest ways to stay healthy while still eating delicious food full of flavor. 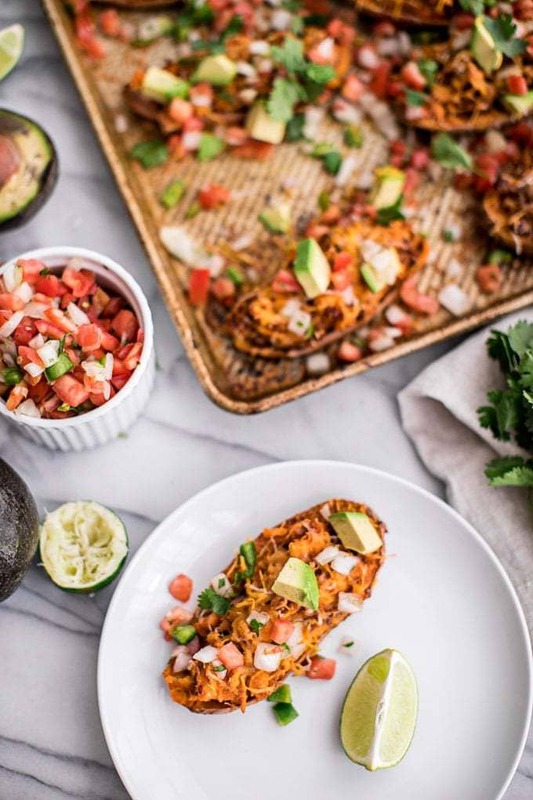 Take these Twice Baked Stuffed Sweet Potato Skins with Chipotle Beans, for example. They’re vegetarian (vegan if you leave out the cheese), gluten-free, full of protein, fiber, Vitamin A, Vitamin C, Potassium and Vitamin B6 (hello, energy boost!)…. 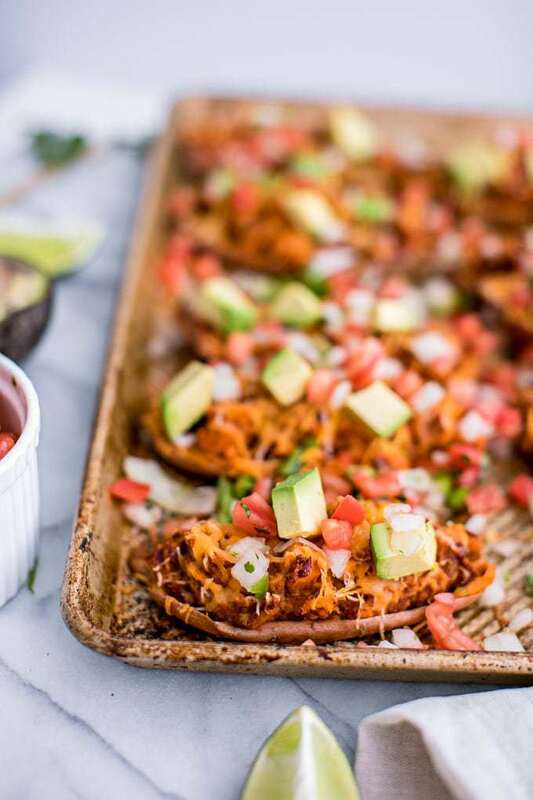 …AND they’re hella delicious, the perfect crowd-pleasing party appetizer that’s so full of delicious, savory, spicy flavor you’ll almost forget how good they are for you. It all starts with sweet potatoes, of course. 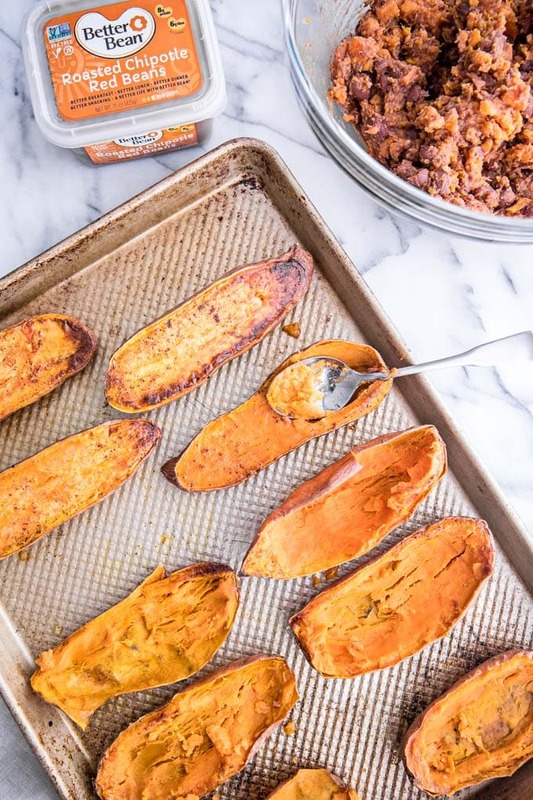 Simply bake them with some avocado oil and salt and pepper, and combine the creamy, sweet flesh with spicy chipotle beans to make the most delicious baked sweet potato filling ever. Bake again with melty Mexican cheese. Then the whole thing gets topped with tons of pico de gallo, avocado and lime juice and your Cinco de Mayo party guests minds get BLOWN! Now, of course, you could use regular potatoes for this recipe if you haven’t yet discovered the magical superpowers of sweet potatoes and beans before (perhaps one of my favorite combos ever! ), but there’s more than just the incredible flavor reason for why you should use sweet potatoes in this recipe. First of all, when it comes to sweet potatoes vs white potatoes, while both provide much-needed resistant starch, white potatoes only offer 1.8 grams of fiber, while an equivalent serving of sweet potato provides 4 grams (source). Fiber is what makes us feel full, keeps our digestion running smoothly and helps regulate blood sugar levels and cholesterol. Sweet potatoes also contain WAY MORE vitamin A than regular potatoes, making them a better choice for your vision, immune system and healthy skin. In fact, 1 cup of sweet potatoes contains nearly 19,000 IU of vitamin A (400% of the recommended daily value), compared to only 6 IU in white potato. Sweet potatoes also have slightly more potassium than white potatoes, which nourishes your nervous and muscular systems, as well as supports your metabolism. And sweet potatoes, have fewer calories and total carbs, than white potatoes. Of course, this isn’t to bash regular potatoes–I LOVE regular potatoes and eat them regularly. And, for the sake of comparison, white potatoes are higher in essential minerals, such as iron and magnesium (source). 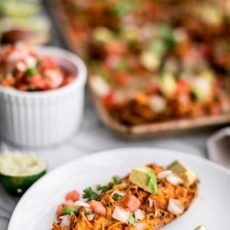 But sweet potatoes do provide some unique health benefits, and their sweet, creamy flavor pairs so perfectly with this recipe that it wins out for me in this instance. Still not convinced about the virtues of sweet potatoes? I get it–the media has led us to believe that all starchy carbs are the enemy. But I promise you, in moderation, they’re not. 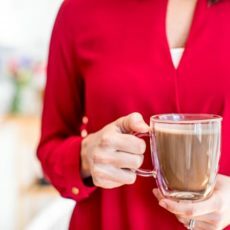 Not only are sweet potatoes a low-calorie, nutrient-dense food, but they’re also low on the glycemic index (which means that they won’t spike your blood sugar, despite their carb content). That’s right! Eating sweet potatoes can help with weight loss, not to mention building muscle (they’re also high in protein)! 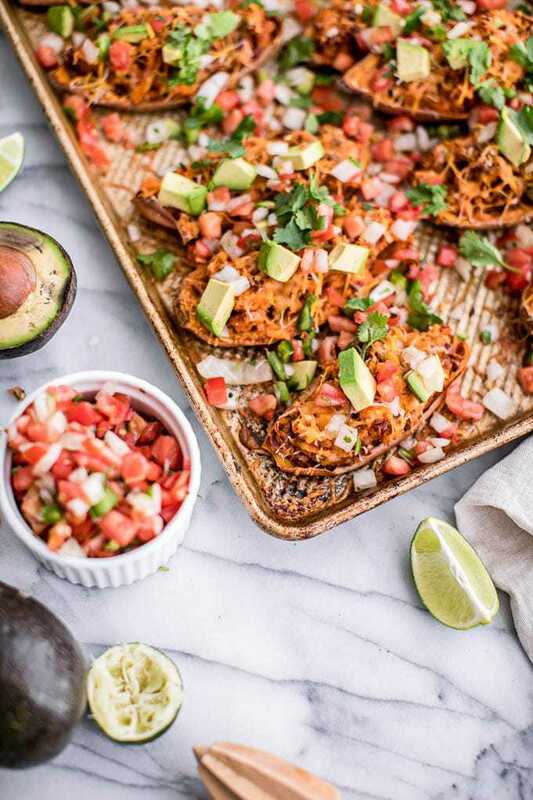 And because this recipe contains healthy fats from avocado and a little organic cheese, you’ll absorb the nutrients from the sweet potatoes more easily! Score! Since we’re in comparison mode today, let’s also talk about sweet potatoes vs yams. To be clear, these are not the same vegetable, despite the fact that most grocery stores mislabel them and sometimes even use them interchangeably. Yams are a Caribbean cousin of sweet potatoes (which are from South America), which traditionally have the same white flash color as regular potatoes. The big difference between yams and sweet potatoes: sweet potatoes are lower in calories and higher in antioxidants (particularly Vitamin A), though yams do contain higher levels of potassium. For this recipe, skip the yams and go straight for the sweet potatoes. Your gut will thank you! And, eat the skins. 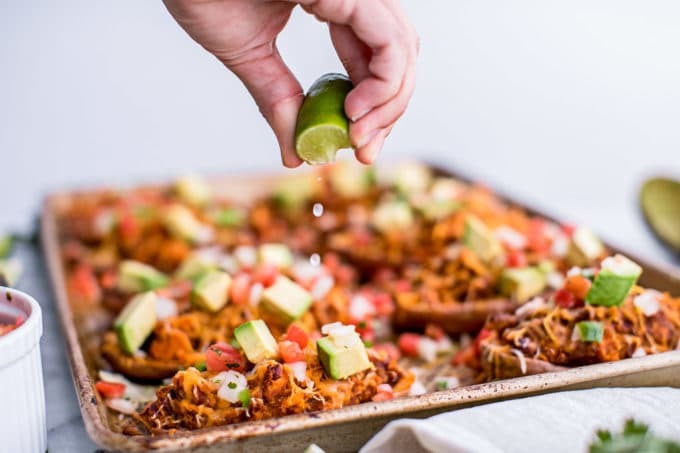 I know that sounds obvious for a stuffed sweet potato skins recipe, but some people toss the skins from potatoes and miss out on TONS of nutrients. Though definitely buy organic sweet potatoes, since the skins of conventional sweet potatoes contain tons of pesticides. Blech! These little beauties will make the perfect appetizer for your Cinco de Mayo festivities this weekend. 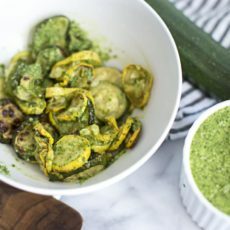 I hope you love them as much as I do (I also serve these on gameday or any party where I need a delicious, yet guilt-free appetizer that everyone will love). Preheat oven to 425F. Cut sweet potatoes in half, longways. Drizzle with oil and season with salt and pepper. Arrange on a baking sheet, flat side down. Bake for 30 minutes. Once the sweet potatoes have cooled enough to handle, scoop out flesh with a spoon and add to a large glass bowl. Make sure you leave all of the skin and a little bit of the potato flesh so the skins are sturdy enough. Add the chipotle beans to the sweet potato flesh and mash to combine. Scoop the mixture back into the sweet potato skins and top each skin with 1 tablespoon of shredded cheese. Bake for another 10 minutes, broiling for the last 2 minutes to get the cheese super melty. Top generously with pico de gallo, avocado and drizzle with plenty of lime juice. Serve and enjoy! *Note: Nutritional Panel uses just red beans in place of Better Bean’s product. I love stumbling upon delicious recipes, only to discover that I already have all the ingredients on hand. YES! Will be making a version of this tonight, can’t wait! So excited to try this! I never would have thought of anything so fun for sweet potatoes!